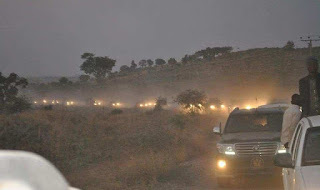 Boko Haram attacked the convoy of Borno State Governor, Kashim Shettima, on a campaign trip along a major road in the central part of the state, yesterday, leaving five people dead. Security sources at the Government House in Maiduguri, the state capital, told Daily Sun the insurgents ambushed some vehicles on the governor’s campaign convoy, yesterday morning, along the volatile Dikwa-Gamboru/Ngala Road. The vehicles affected were those at the tail end of the long convoy, another source disclosed, without official confirmation. “We saw some men dressed in full military uniforms and kits in two four-wheel drive painted in military colour, with anti-aircraft guns,” one of the survivors and a senior government official said. The official said not many in the convoy knew the men in military camouflage watching them by the road side were Boko Haram members, until they shot at them. “The governor just passed them with security escorts. Some of the vehicles at the back ran into a sandy area and we were trying to manoeuvre from the place. This broke the convoy into two and gave Boko Haram the opportunity to intercept us,“ the official added. He said he fled into the bush where he spent the night. Yet, another source was emphatic that three members of the Civilian Joint Task Force were killed, while two soldiers were also killed. The Dikwa-Gamboru/Ngala road in the central part of Borno is a volatile one. A few attacks by Boko Haram in the past included ambush on military convoy and aids workers. The military did not immediately respond to request for official confirmation from Daily Sun. Newly-appointed spokesman of Operation Lafiya Dole, Col. Ado Isa, asked the newspaper to contact the governor’s media aide for information on the attack.